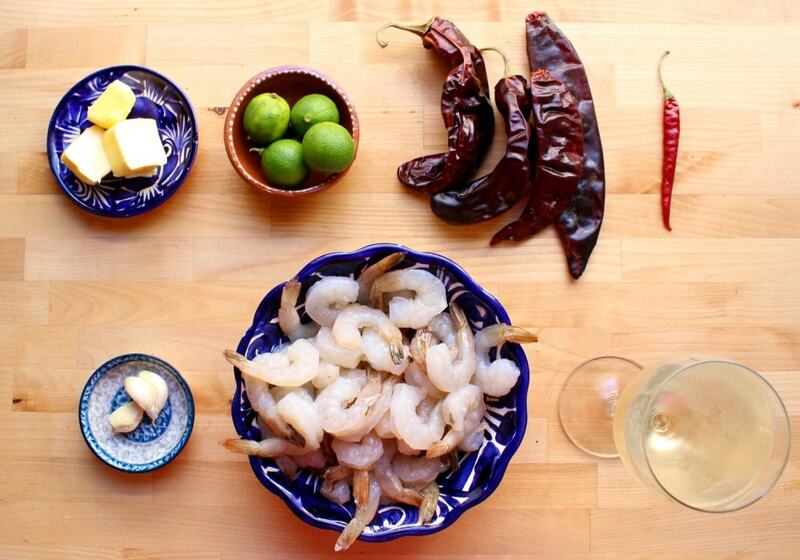 Camarones al Ajillo is a tasty Mexican dish that comes together in a snap. 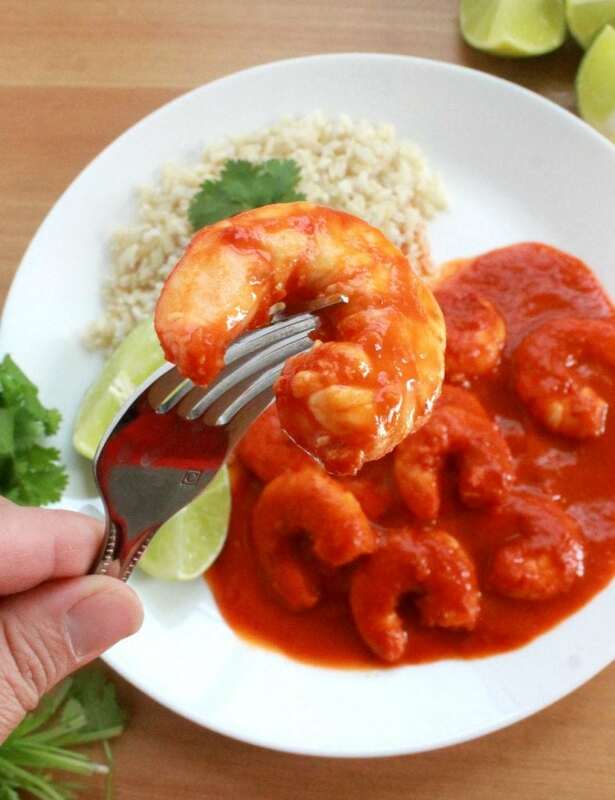 Juicy, plump, and succulent shrimp swimming in a savory chile sauce. 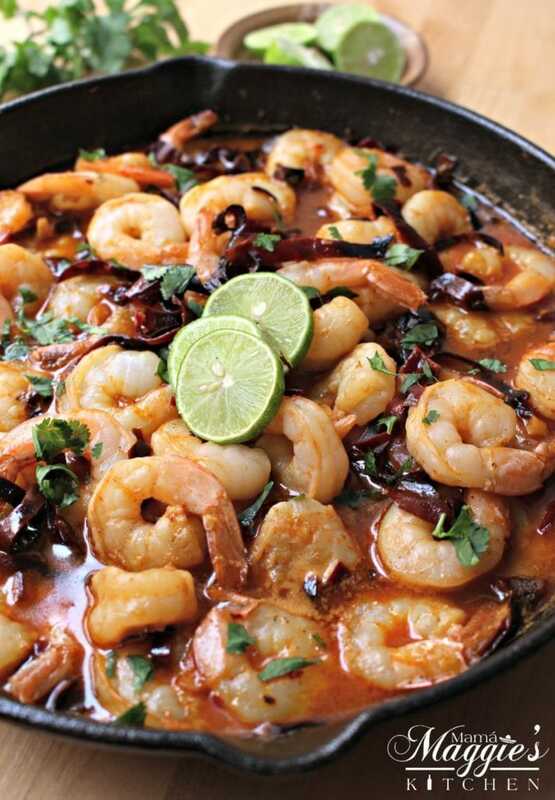 Camarones al Ajillo is an incredibly yummy Mexican dish with a flavorful and robust sauce. I’m seriously addicted to saucy food. It must be a Mexican thing. I can’t get enough of Mexican sauces and Mexican salsas. 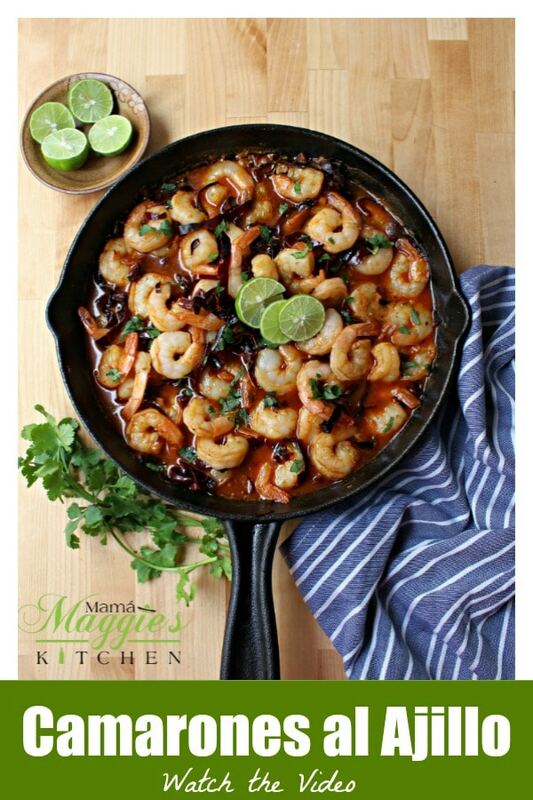 • For my fellow Spanish speakers, this is “Camarones al Ajillo estilo Mexicano.” There are different recipes out there from Spain, Peru, and every other Latin American country. My favorite part of this dish, though, is how fast this recipe comes together. In less than 30 minutes, you have a super yummy Mexican seafood plate that everyone will enjoy. 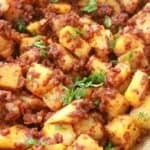 Check out the VIDEO or follow the step-by-step tutorial below to make this yummy recipe at home. See the picture above. Those are the ingredients you will need. I am adding white wine, but you can swap that out for chicken broth, vegetable broth, or shrimp broth. Put the shells in a stock pot with water, salt, and garlic. If you have any herbs laying around, you can add those to the pot too. Bring to a boil. Let simmer for 10 minutes. The shrimp stock will last up to 3 days in the fridge and 4 months in the freezer. Whatever type of stock you end up using, your Camarones al Ajillo will still be just as delicious. My advice is to buy shrimp that is already deveined. Life is too short to be dealing with that crap. Literally! Lol. These are large shrimp. 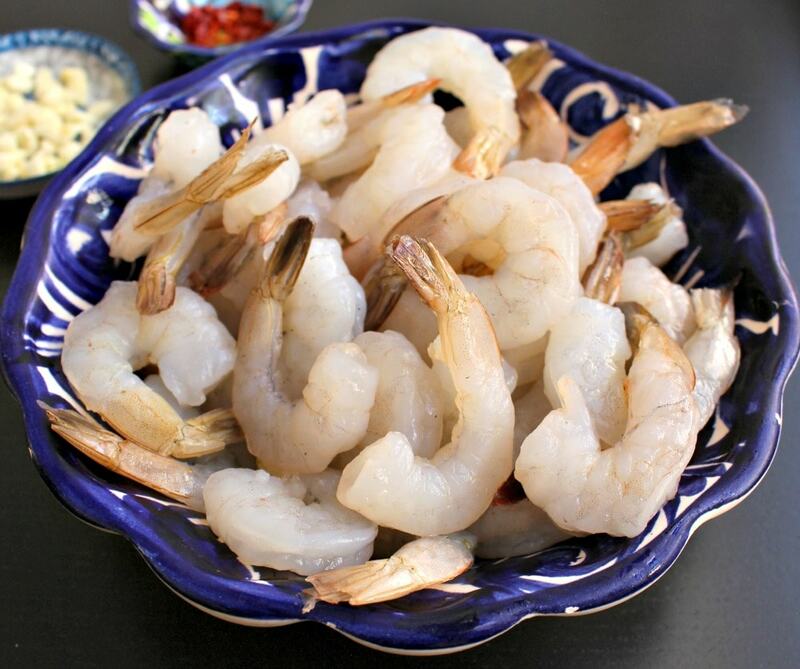 Use whatever size shrimp you like that equal 1 pound. The two are very similar. Both have butter, lime juice, and garlic. The big difference is the chile guajillo which is included in the Camarones al Ajillo recipe and not in the Camarones al Mojo de Ajo. 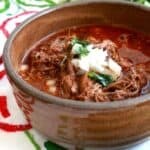 • Again, this is Camarones al Ajillo receta mexicana, a Mexican recipe. You might see it made without chiles, and that is not the Mexican version. Clean the guajillo chile with a wet paper towel. Gently slice the chile, or you can dice the chile too. 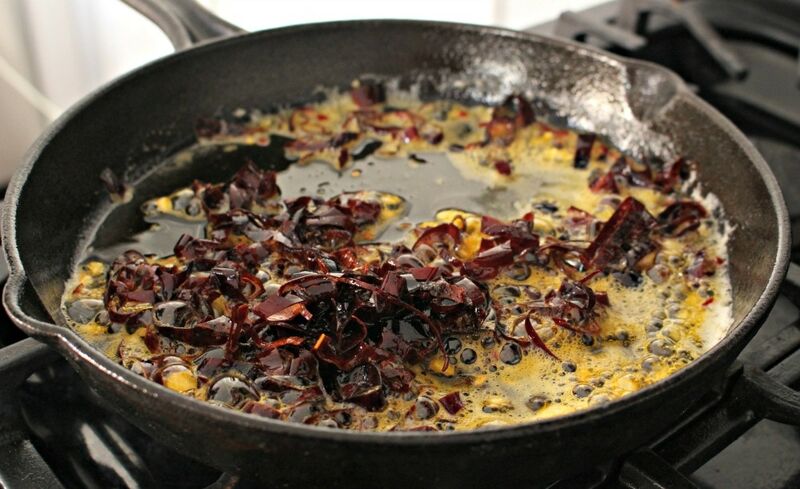 Guajillo chile is not very spicy, and it will add depth to the dish. For me, Camarones al Ajillo also includes a little spice. I know, I know, guajillo chile is a dried chile, but it does not add the kick I’m looking for. 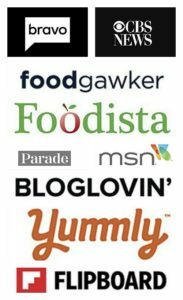 • That’s why I add Chile de Arbol. Not this many, just one chile de arbol if you like some spice. If I was making this for my grandma (who loved her spicy food), I would add two chile de arbol peppers. Adjust according to your palate. If you are not into spice but want flavor, don’t add the chile de arbol. “Al Ajillo” is a term that references garlic. I like to rough chop the garlic clove. That’s the way I’ve always made Camarones al Ajillo. We are creatures of habit, after all. I’ll mince in most dishes, but there’s something about doing things the way they’ve always been done. 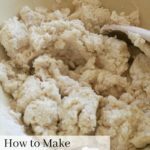 • For those of you who don’t like big chunks of garlic, go ahead and finely mince the garlic. 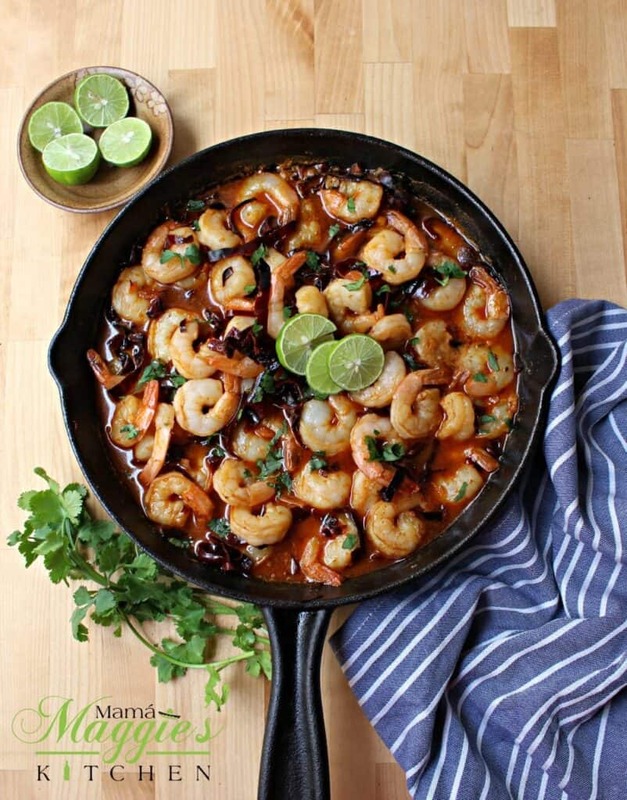 Choose a skillet that is large enough to fit all the ingredients for Camarones al Ajillo. 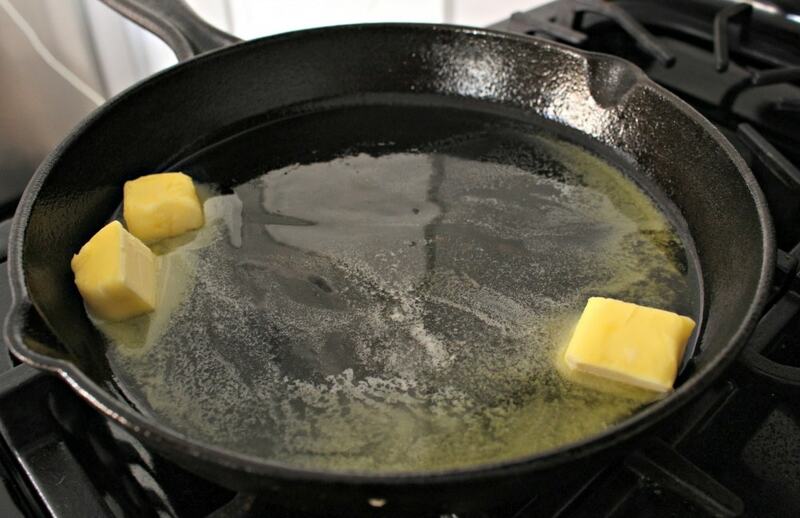 • Then add butter to a large skillet. For a completely lactose-free recipe, use olive oil instead of butter. • Next add the chiles. This will only take one to two minutes. Do not go far. Burned chiles will taste bitter, and you will need to start all over again. 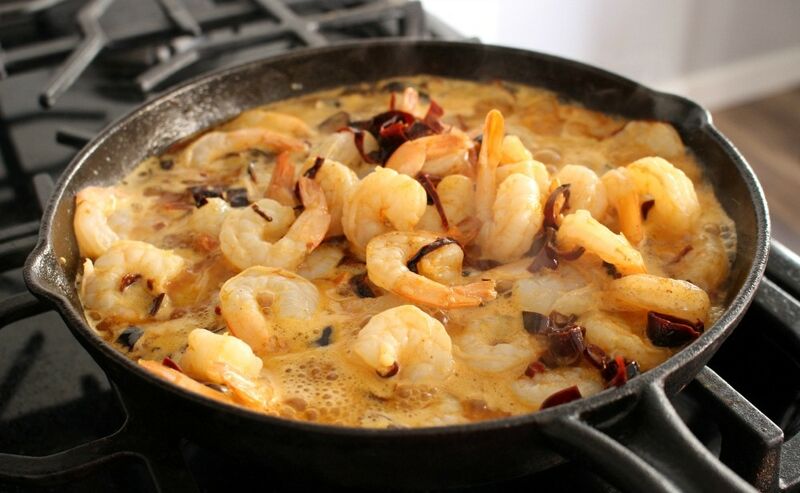 • Add the shrimp and all the remaining ingredients. It will only take a few minutes for everything to cook thoroughly. Once the shrimp are pink, it’s ready. Don’t let the shrimp cook too long. If they are overcooked, they get rubbery. 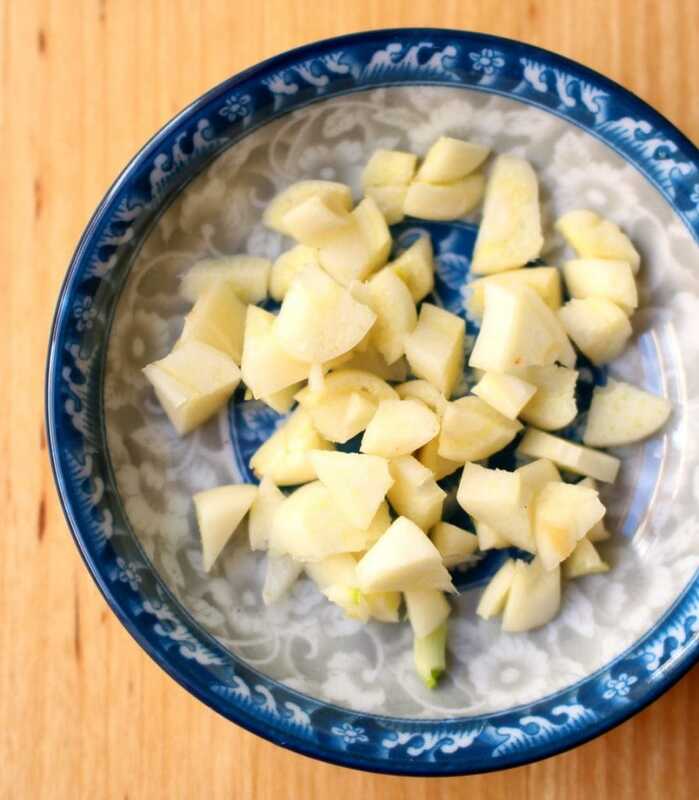 You might see Camarones al Ajillo on a menu as an appetizer and served on a tostada. Or make it at home for a quick dinner alongside some rice and green veggies to soak up the sauce. YUM! 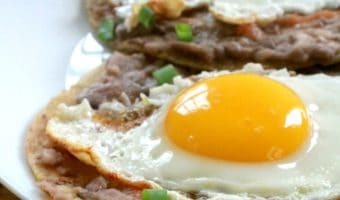 • For those of you looking for a keto-friendly, diabetic-friendly Mexican recipe, serve with veggies or next to a salad. Be careful not to burn. Add the chile guajillo and chile de arbol (if using). Add the shrimp, lime juice, white wine, and salt. Cook for 5-6 minutes, or until shrimp is pink and fully cooked. 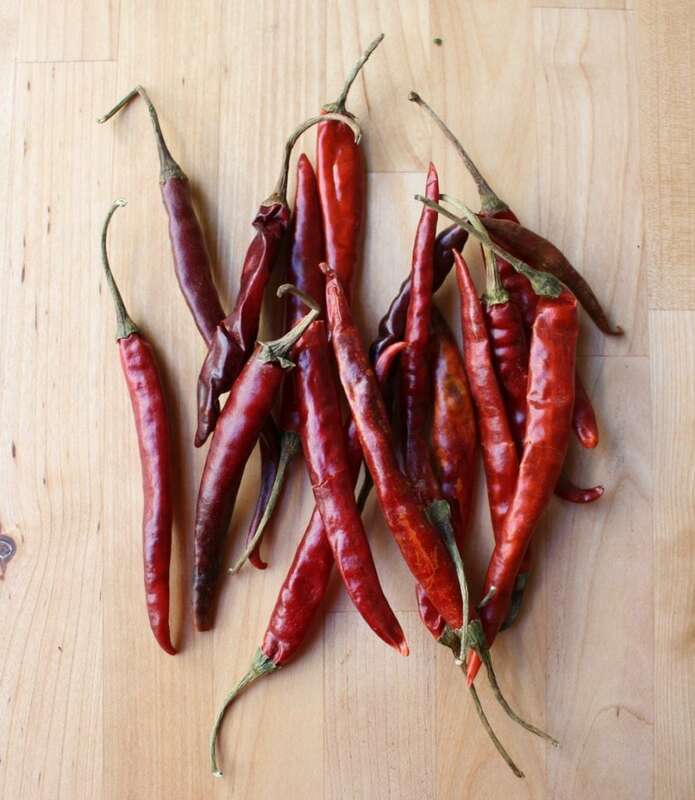 For a spicier dish, add one more chile de arbol. For a less spicier dish, omit the chile de arbol. You can also use chicken or vegetable stock instead of the white wine. Crank up the heat with Camarones a la Diabla, or Mexican Deviled Shrimp. 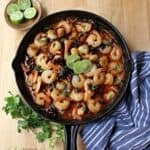 This typical Mexican seafood recipe is made with juicy, plump shrimp in a spicy sauce, and it’s ready in under 30 minutes. Serve with rice, lime wedges, and a large glass of water. Enjoy! 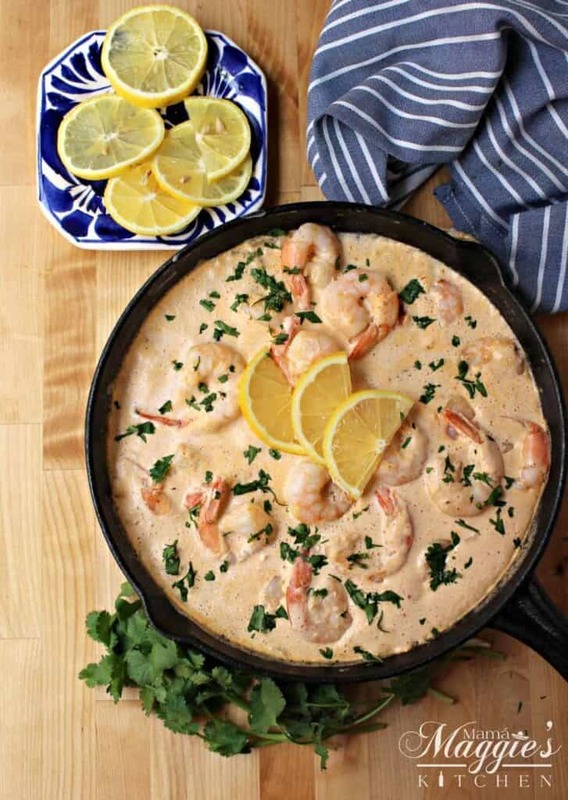 Camarones en Crema Chipotle are juicy, large shrimp in a creamy chipotle sauce. 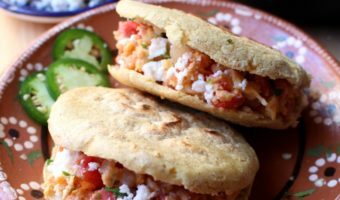 This Mexican seafood recipe is absolutely delicious and ready in under 30 minutes. 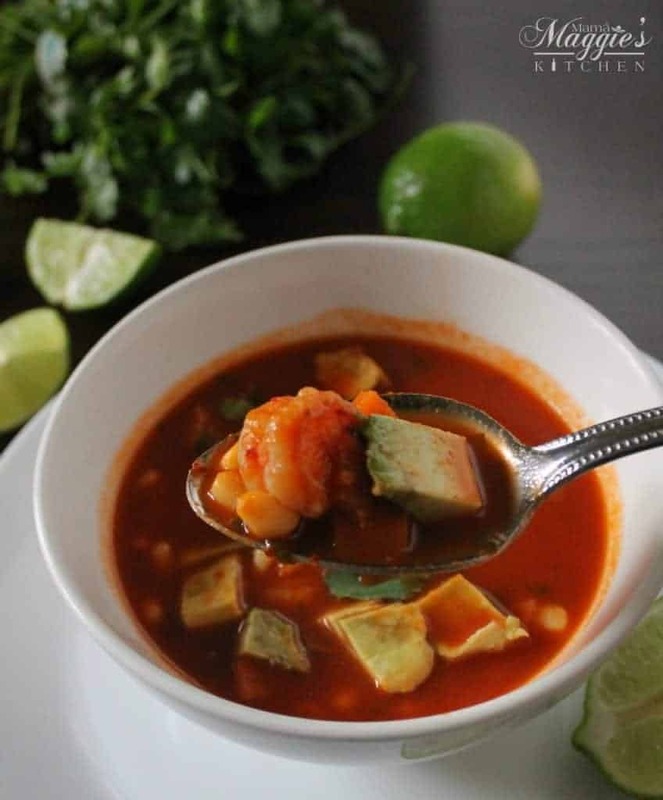 Caldo de Camarón, or Mexican Shrimp Soup is a hearty Mexican soup full of shrimp and veggies. Usually made with yummy, comforting goodness and lots of love.